Imogen's Typewriter. 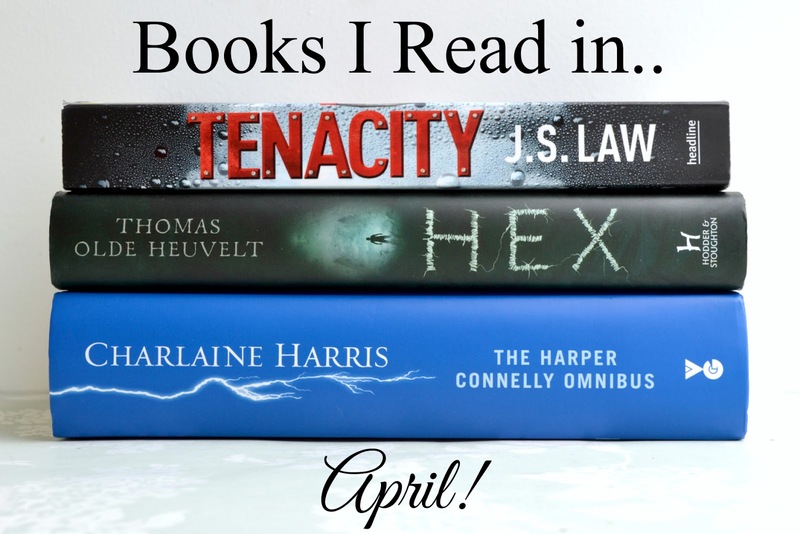 : Books I Read in.. April! There's something so soothing about a Charlaine Harris book normally, but the Harper Connolly series is very close to the edge on that. It doesn't have the same feel that the Aurora and Sookie books had, maybe because the protagonist is on the road. Hotels don't have the same feeling of security and community Harris does so well. However, I did really like it. I'm normally pretty good at guessing whodunit but in this case- straight up didn't know who did it. Harris really kept me on my toes. There were inklings but I think I came to the conclusion at the same time Harper did in the narrative. Speaking of Harper, definitely an interesting protagonist. Getting struck by lightening and being able to sense dead bodies and see how they died. Spooky. This one was slightly more obvious. Despite all the twists and turns, I had a pretty solid idea of who the murderer was early on and I was right. And the characters were just so hateful. Even Harper got on my nerves in this one. There was an LGBT+ character as well which is still something quite rare in the novels I've been reading lately that I give a little cheer when one is included. Even if it's a minor character. Another little aspect I loved was how Harris talks honestly, through Harper, about religion in the Bible Belt of America. I have friends who live in the belt and it's always been a point of interest for me. Give me more of this in novels please. These books sound really interesting, I'll have to give them a go! Great post!